Cover of the November 1938 issue of Radio-Craft magazine. 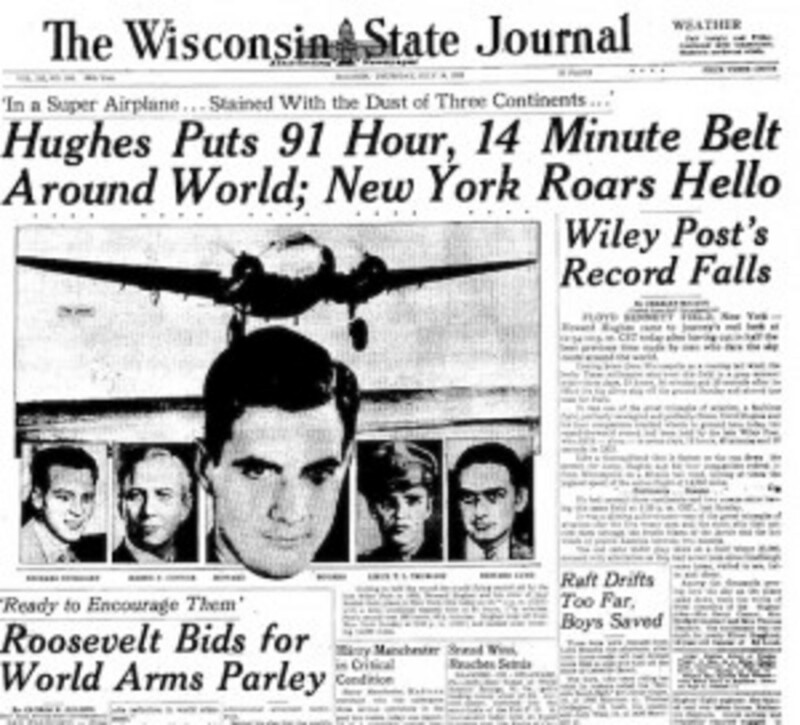 On July 14, 1938, Howard Hughes and four companions landed triumphantly at Floyd Bennett Field in New York, setting a new world record for circumnavigating the world of 3 days, 19 hours, 14 minutes and 10 seconds. Thousands of people gathered at the airport (which is today a park) to greet the tireless aviators, but in the days before cellphones one needed to find a landline if you wanted to brag to your friends about being there on that historic day. Enter the New York Telephone Company&apos;s "public telephone truck." While the press had 47 of their own dedicated telephone lines to deliver on-the-spot news of the Hughes flight, members of the public could line up to use one of the five public payphones available in a truck parked near the airfield. 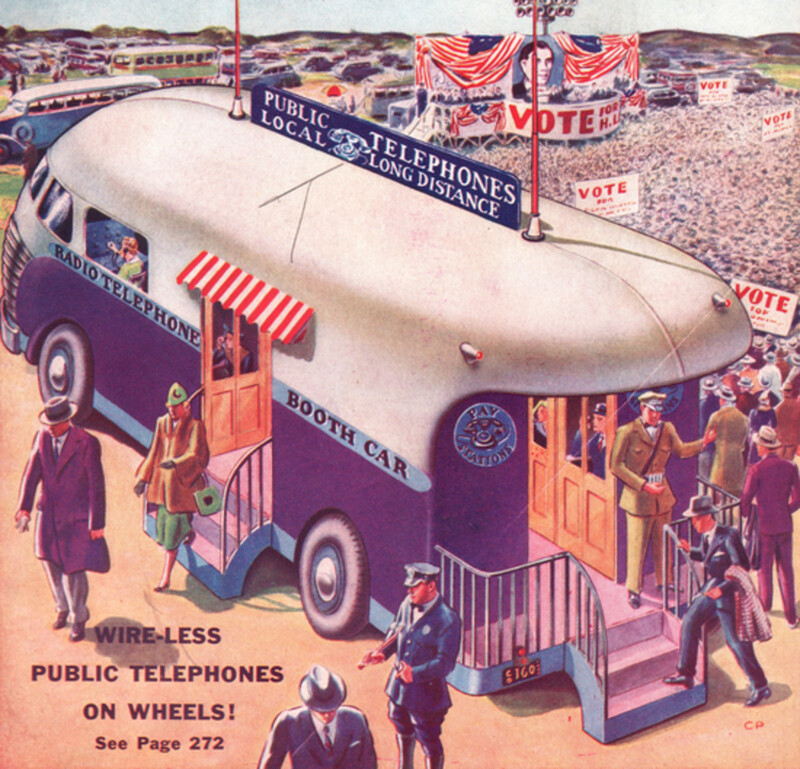 The November 1938 issue of Radio-Craft magazine featured an article about the use of these trailers, trucks and buses at big outdoor events to provide phone service for the public. At that time, mobile public telephone trucks were only being used in New York and Maryland but Radio-Craft imagined the day when such trucks would be widespread. The trailer is equipped with 5 comfortable and attractive telephone booths, in each of which is installed a cradle-type handset. Immediately to the right upon entering the trailer is the desk of the attendant who places and times all calls and collects the charges for them. After the customer has given his request to the attendant and the connection has been completed, he is assigned to an idle booth where he can converse with the called party in privacy. If he wishes to make additional calls, he can do so without leaving the booth. This is made possible by an intercommunicating circuit between the booth and the attendant. In planning the trailer every effort was made to provide comfort and convenience for the customer in using the telephone. Each booth is equipped with an upholstered seat, an electric fan and a heater; the outer room is provided with a comfortable bench for waiting customers. Mahogany walls and chrome fixtures add color to the interior of the trailer. All Maryland telephone directories, as well as those of frequently called cities outside of the state, are a part of the trailer&apos;s accessories. The article explains that the trailer had recently appeared at the Baltimore automobile show, where about 800 calls were made. 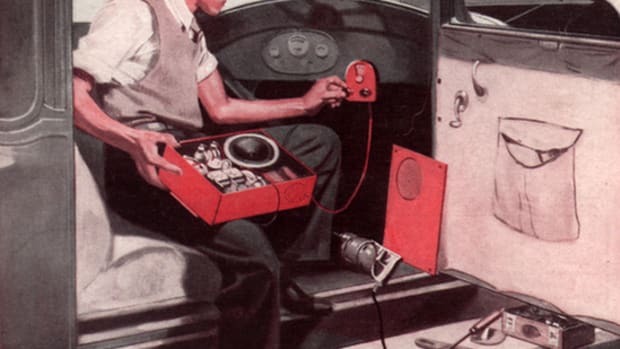 Radio-Craft speculated that sometime in the near future the public telephone trucks could even be liberated of the need for a landline, and could instead use radio to transmit calls at big rural events where physical telephone lines weren&apos;t available. 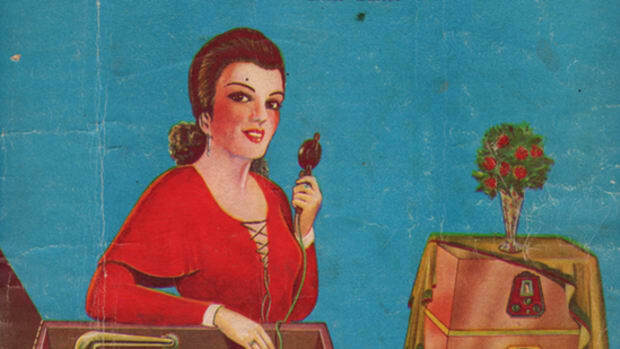 The cover of the magazine showed a huge political rally (no doubt inspired by the the midterm elections of November 1938) and the people of the future using "wire-less public telephones." By 1938, radio had well established itself as an important broadcast medium in the United States. 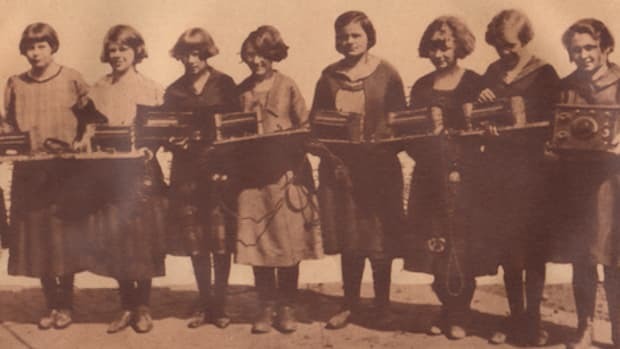 But in an almost nostalgic throwback to the late 1910s and early 1920s (before broadcast use was seen as inevitable), radio geeks were still working on ways to revolutionize the technology with more creative methods of point-to-point communication. No doubt everyone here in the 21st century who has futilely tried to use an overloaded wireless network at a sporting event or concert understands that perhaps we haven&apos;t made all that much progress since 1938 after all. How the gleaming white fridge changed our relationship to food. 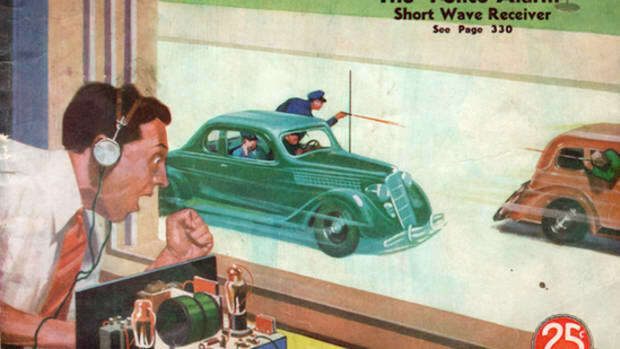 In simpler times the mere presence of a home-built police scanner was lauded as a home course in law enforcement. But has Twitter killed the police radio star? 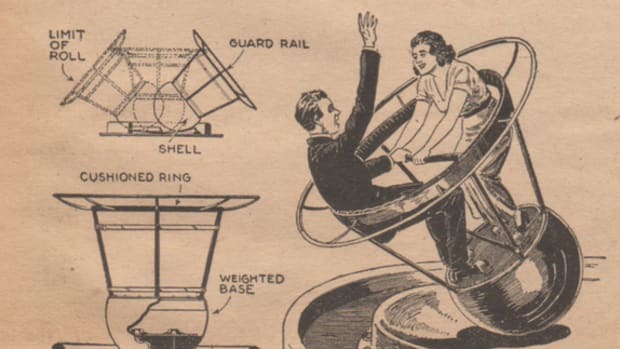 Today's amusement park rides thrill with the frisson of danger, but for the rides of the last century the risk was more real than imagined.